Best brace for ankle and foot pains and strains with sports and recreational activities Whether your ankle pain is long standing or a freshly sprained ankle, bracing is an effective way to decrease pain and stabilize the injured joint. There are many braces on the market and they serve different functions, making it difficult to choose the best one, especially for active people. Additionally, copper braces are popping up left and right with many professional athletes singing their praises. The Treat My Feet Ankle Brace provides support to not only the ankle but to the entire foot including the plantar fascia to keep you comfortable and mobile and get you back on your feet. Whether you are a weekend warrior, competitive athlete, or have an active job on your feet, compression around the ankle joint in our unique silicone “C” cup padding provides support and helps protect against injuries. Compression in the brace helps to reduce swelling, improve circulation from the foot to the body, and reduces pain from arthritis. This soft brace is stretchy and easy to fit under a work or athletic shoe. It is moisture wicking and can be worn while recovering from a new injury, or as added security to help reduce the risk of injury. The Treat My Feet copper infused ankle brace is perfect for impact sports such as volleyball, basketball, football, track, running, racquet ball, tennis, and softball or baseball. It can be worn by men, women, and children. With both chronic and new injury to the foot and ankle, ice and compression are recommended to assist the ankle in swelling. For acute or new injuries it is beneficial to visit a health care provider such as a physician, physical therapist, or podiatrist. Brace wear is recommended while the joint is healing and when returning to a physical activity after injury. The Treat My Feet Ankle Brace offers the best in quality, breathability, stability and support with a money back guarantee. COPPER INFUSED for maximum benefits. Copper has antimicrobial properties so no stink! Engineered with interlocked stitching and silicone ankle support for maximum foot and ankle compression. RELIEVE FOOT PAIN – Tired, aching feet find pain relief with our foot sleeve & compression support socks. Best ankle support brace for running, exercising, and day to day activities. 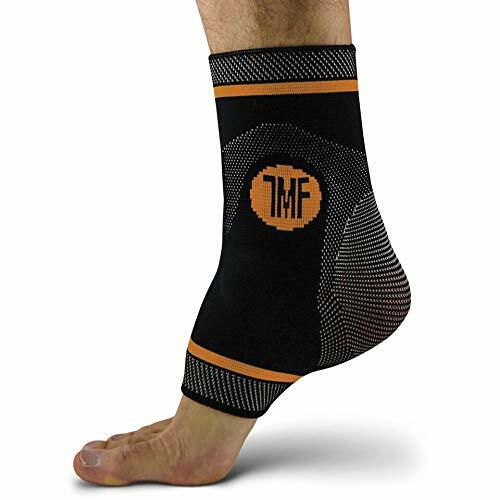 FDA REGISTERED – Doctor recommended ankle brace. Prevent injury and recover faster. Sore feet? Weak ankles? Copper infused compression socks with silicone ankle support are the answer! PLANTAR FASCIITIS SUPPORT – Don’t let plantar fasciitis slow you down! Athlete approved plantar fasciitis socks will help you stay active. Best plantar fasciitis foot sleeve & compression support!